Kartika-The "Sale of the Year"
Such is the benefit of devotional service in general. However, during certain times of year, such as appearance anniversaries of Lord Krishna and His devotees, the benefits of one's service are compounded. "Those who worship Lord Hari with an offering of one hundred thousand tulasi leaves during the month of Kārtika certainly advance on the path of pure devotional service, which includes liberation, with each leaf offered. (Hari-bhakti-vilasa, 7.336)"
"It is better to offer malati flowers to Lord Kesava in the month of Kārtika than to donate gold, cows, or land to worthy recipients. Malati flowers are pleasing to Lord Kesava (Krishna) in whatever month they are offered. In the month of Kārtika, the offering of malati flowers awards one the merit of performing a horse sacrifice. " The Vedas do not recommend horse sacrifices nowadays, anyway. They don't work. Better to chant Hare Krishna. Not bad. And the list goes on. Whatever you offer--tulasi, malati, ghee lamps, time, energy, attention--takes on greater significance this month. Kārtika could be thought of as the ultimate "buy one, get a-whole-lot-more free" sale, (or the equivalent of a "super, multi-triple word score" for those familiar with the game of Scrabble. For a limited time only, whoever is lucky (or greedy, or intelligent) enough to do some service for Krishna during this special month gets a uniquely huge return on their investment. The ultimate return: one becomes more Krishna conscious. 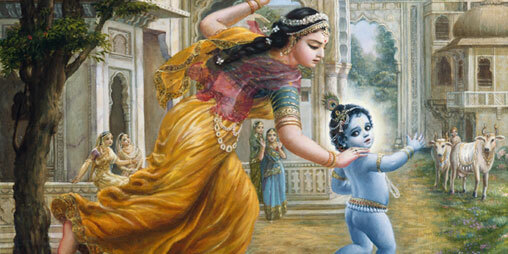 It was during Kārtika that Krishna allowed Himself to be bound with ropes by His mother, Yasoda. Out of loving anger at her transcendentally naughty Child, she tied him —dama— around the abdomen—udara—with ropes. Thus the month of Kārtika is also known as the month of Damodara, "He Who was bound around the abdomen". He elaborates on this in the section "Performing Devotional Service in Kārtika:"
". . . in the month of Kārtika (October-November); especially in Vrindavan, there is a specific program for temple worship of the Lord in His Dāmodara form. "Dāmodara" refers to Krishna's being bound with rope by His mother, Yaśodā. It is said that just as Lord Dāmodara is very dear to His devotees, so the month known as Dāmodara or Kārtika is also very dear to them. . . The execution of devotional service during Ūrja-vrata in the month of Kārtika is especially recommended to be performed at Mathurā. This system is still followed by many devotees. They go to Mathurā or Vrindavan and stay there during the month of Kārtika specifically to perform devotional services during this period." Prabhupada makes a point to say it is "especially recommended" to perform devotional service during Kārtika in Mathura, or Vrindavan. This is not to say that Kārttika's benefits are exclusively available there, but devotees who are able to go often make the trip. "Urja-vrata" refers to the acceptance of special vows during Kārtika. Devotees often take vows to increase their hearing, chanting, worship, or to observe restrictions in their eating. Making and keeping such vows during the month of Damodara guarantees compounded benefits. If even an "unserious" person can attain Krishna's personal service, simply by "executing devotional service according to the regulative principles during the month of Kārtika," wouldn't it then also be a seriously good time to get serious? - listen, read, and sing along with this song glorifying Krishna's naughty childhood pastimes, which is sung each day during Kartika. - two widely celebrated Vaishnava festivals happening during the month of Kartika.